I'm Here. I'm Queer. What the Hell do I read? 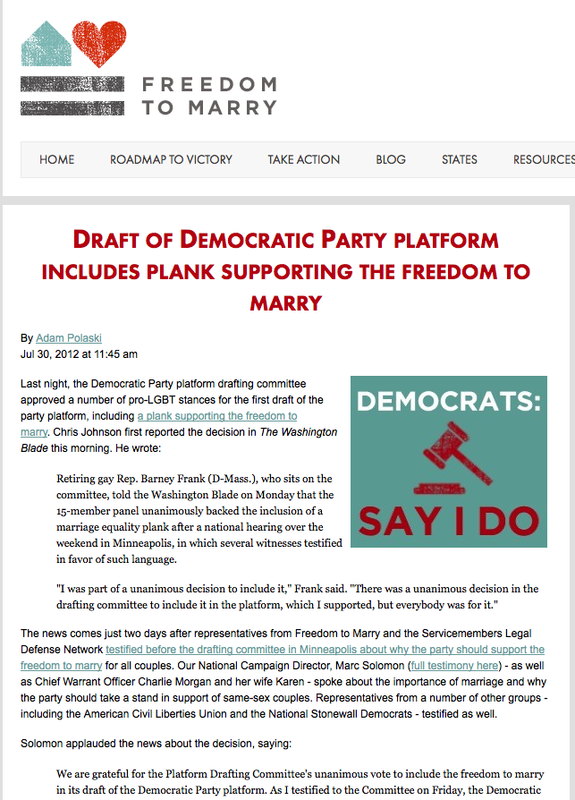 : Democratic Party Platform Drafts Plank Including Support - Unanimous Support - for Gay Marriage! 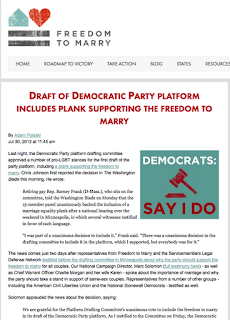 Democratic Party Platform Drafts Plank Including Support - Unanimous Support - for Gay Marriage! This is pretty cool news. Sources are reporting that on Sunday July 29, 2012, the Democratic Party platform drafting committee included language supporting gay marriage, opposing the "Defense of Marriage Act" and supporting the Employment Non-Discrimination Act. This puts pressure on the Democratic party as a whole to accept these steps forward for equality on their final plank, which they'll be voting on in September in Charlotte, North Carolina. By including marriage equality in our platform, the committee has reaffirmed the fundamental American value of equal protection and civil rights for every American. After working to advance the cause of marriage equality for many years, it is a point of personal pride to see Democrats unite around the principle of respect and dignity for all families. ... Our platform will be based on the values of the American people and will keep moving our country forward to progress and prosperity for all. We'll see what they do in September, but for now, it's a Great moment for equality.